With the gift of books from my family last Christmas, I've started thinking of building-up a book collection like proper fans of books do. You know: get a bookshelf, fill it with books you've actually bought. As opposed to what is, and has been, my habit of the last several years of going to the library and reading everything for free. 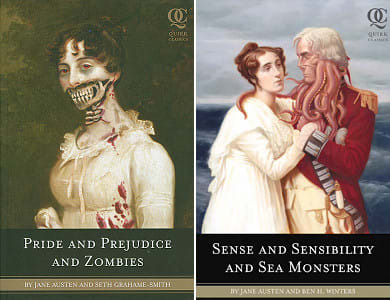 So a few weeks ago I went to Borders and made my most recent (and only, if you exclude text books or gifts for other people) purchase of books: the 2 books from the Jane Austen + monsters series thus far: Pride and Prejudice and Zombies, and Sense and Sensibility and Sea Monsters. Firstly, I chose these books because it was just a few days before when I was discussing with laundry lass and her friends about this series in particular. I was able to tell the story of how I was introduced to these by an audio book of Pride and Prejudice and Zombies which was played during my New Years holiday when my mates and I were sitting under the sun: we lol'd while we lolled. Secondly, I bought the books during a sale at Borders because when you go from getting your books for free (or a few dollars on the occasions that I had to reserve items or get them ordered in) to having to pay, ANY dollar amount above $10 per book for me feels like waaaay too much to pay for all those pieces of paper. Feeling like I do about book prices, maybe I should've bought an e-reader instead... if only they sold the good ones in New Zealand. Anyway, I've been slowly reading through Pride these last couple of days, and while the twist of having the story set during some zombie plague is definitely interesting, the impression I'm getting so far is that the zombies feel less like a clever plot device and more like a small recurring joke weaved into the boring bits of the story. Maybe it's just like this in the part I'm currently up to, somewhere between 1/4 and 1/3 the way through the book, and I'm starting to think, Dammit, I'm not reading a zombie book, I'm reading Pride and Prejudice! The bastards have managed to get me to read Jane Austen! If the publisher's ploy all along was to get someone like me to read Jane Austen, then kudos to them for succeeding, and a curse on them for their trickery. I'll stick with it through to the end (I did buy it after all) and hope that the zombie thing really picks up and that it becomes more integral to the plot. So it's the same "classic regency romance" with the addition of zombies. My only complaint: needs more zombies. Next: Why aren't book stores organized like libraries?